The 2018 Triumph Tiger improves on everything that it’s done so well in the past. There’s more equipment on offer. At the top of the list is the new 5.0-inch colour LCD instrumentation with auto contrast. The 5-way joystick controls everything on the screen, right from switching between riding modes to controlling the trip metre. The switchgear is soft and feels premium. And then, there’s the reworked motor and gearbox. The engine is more refined than before, and a shorter first gear leads to better low-end grunt. It does have a compromised 0 – 100km/h run though, but it’s still faster on the track than its bigger, more powerful sibling. 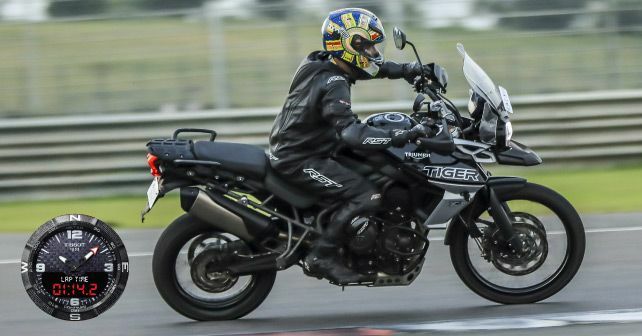 Light-weight materials have helped the Tiger shed some weight, making it more agile than before. However, it still doesn’t feel as nimble as the BMWs, and that’s where it loses valuable points. The Triumph also lost half a point in terms of comfort and practicality. Although its seat height is 20mm lower than the BMW, the Triumph has a wider and larger tank towards the bottom, making it marginally more difficult to manage. The Tiger does recover some points in the value for money department, though. The beauty of the Triumph, however, is the ease with which it performs all its functions. It can be a great highway tourer and an equally proficient off-roader. While it has always had these advantages, the 2018 iteration makes all of it more comfortable than before. But, above all, Triumph has over the years gained a reputation of providing impeccable service – and that’s sure to make the ownership experience that much more hassle-free and enjoyable.